Jason Pak lost both of his legs last December in an IED while in Afghanistan. He is still recovering at Walter Reed but was released for this weekend to come to Orlando! 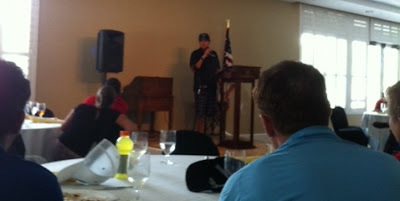 Jason played today with the Warriors Golf Event on Monday, July 29. We had the honor to meet him and many other Wounded Warriors today at the Fairways For Warriors Golf Event and Luncheon held at the Golden Bear Club in Windermere, FL. (http://fairwaysforwarriors.org/) 1LT Jason Pak entered military service being commissioned a second lieutenant upon graduation from the United States Military Academy at West Point in 2011. His military education includes the Field Artillery Officer Basic Course and Ranger School. He holds a BS degree in Systems Engineering. He was a member of the West Point Soccer Team. Jason served as a Platoon Leader in 4/SBCT, 2nd Infantry Division in Afghanistan (near Kandahar). Jason is recovering at the Walter Reed Army Medical Center in Bethesda, Maryland. Take a look at this video of Colonel’s Pak retirement recently. One of the speakers at today's Event was our very own National Spokesperson, COL Danny McKnight, U.S. Army (Ret.) of "Black Hawk Down" renown. COL loves being with these heroes and spoke of their need to decompress and how their inability to do so has some dire consequences. 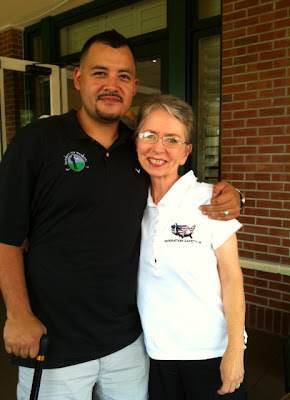 It was such a great joy to be reunited with Wounded Warrior, Purple heart recipient William Castillo. In 2010 Operation Safety 91 had taken William to New Hope Christian Academy in Minneola, FL (http://operationsafety91.blogspot.com/2010/04/os91-brings-us-hero-william-castillo-to.html) to speak to the students who absolutely loved him. It was a grand reunion with William and his dear wife, Katherine, his devoted wife. When all is said and done, OS91 offers our heartfelt congratulations to Fairways For Warrors' Tom Underdown, who is helping our Military heroes, whose need is overwhelming. Thank you so much to our very own Board Member, Al Haslam, who is a loved and honored member of this group and who connected us. Of course, we took advantage of this opportunity to hand out Psalm 91 cards. Below is a picture of one of our Veterans who told us that he had a Psalm 91 card years ago and prayed it daily when he was deployed. "Wouldn't be without it!" OS91 welcomes to our Advisory Board Rev. Dr. Mike Vidal, U.S. Navy (Ret. ), G.S.D.F. COL Chaplain, and presently Chaplain at Orlando Police Department. Mike has been a blessing to OS91 for about 1 1/2 years, so now it's official: Mike, you are now part of the OS91 Team! We appreciate you! OS91 was honored to attend the "Celebrate America" Event followed by the Family Fun Fest at Bell Shoals Baptist Church of Brandon, FL on Sunday evening, June 30th. This is one patriotic Church! Every year all Responders are honored in this Event: Firefighters, EMS, Law Enforcement and every branch of the Military. These are the true American heroes! Cross Pins given out at "Celebrate America"
OS91 was invited to attend this Event to give out Psalm 91 cards and books to the Responders and all those who attended. Hundreds and hundreds of Psalm 91 cards and books went into these grateful peoples' hands. Deputy Douglas Duvall of Hillsborough County Sheriff's Office, who made national news lately for pulling out the man who went into the sinkhole to save his brother. Deputy Duvall was awarded the 1st Annual Bell Shoals Responder of the Year Award for his heroism. OS91 congratulates Bell Shoals on a spectacular "Celebrate America" Event; truly "over the top"! Omar Martinez - Winter Garden Fire Dept.